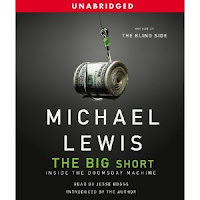 I just finished Michael Lewis' new book, The Big Short. Wow. That's what I have to say about this book ... wow. It provides an interesting perspective on the recent credit crisis by centering on the activities of 4 groups of people who simultaneously anticipated the crisis and set about to profit from it: a pair of 30-something dilettantes working out of their garage in Berkeley; a brilliant one-eyed doctor with aspergers in San Jose; a wunderkind stock analyst turned hedge fund manager; and an arrogant, fast talking, self-promoting bond salesman from Deutsche Bank. In telling the stories, Lewis does a good job of explaining the complex financial instruments that were at the heart of the crisis. Home mortgage originators were packaging loans into bonds and selling them to the uninformed buyers who failed to perform proper due diligence to understand the nature of the assets backing these securities. They were actually incapable of performing that research because the information was simply not made available. Many bonds had only a fraction of sub-prime loans, but some had 100% sub-prime content. Then the financial houses decided to create credit default swaps (CDS) on those bonds to hedge their positions (basically a short on the bond). The people Lewis describes were simply buying up these CDS; specifically cherry-picking the ones that had the highest probability of defaulting. The brainiacs on Wall Street then started packaging the worst of loans into CDOs. These were filled with the "mezzanine" bottom level highest risk loans, then magically [read: fraudulently] were rated AAA by the ratings agencies. If only 7% of the loans in those bottom brackets default, then the entire bond is worthless (and the CDS owner is due the original value of the bond). If a CDO is crammed full of those risky loans, then the odds of it becoming worthless is almost 100%. The people Lewis writes about took months to figure this out, and were still sceptical because of the potential calamity and their trust in the system correcting for this. They started buying up CDS on bonds from 2005, knowing that these were packed with ARMs that had 2 year teaser rates. This meant that the 2005 bonds would experience dramatically high default rates 2 years later in 2007. They were proven right. Based on my recent readings on this subject, I can say that no single book has the complete story. Each author has their own interests, their own focus, their own filter. I probably still haven't read the entire story. But with each book, I gain a little more knowledge. It's astounding how little the public knows about how the financial world works, and specifically the world of structured finance and asset backed securities. We're all encouraged to place all our trust in a few public figures, like the Fed Chairman and the Secretary of Treasury. But the shocking truth is (at least was) that these highly educated and experienced men had absolutely no idea what was actually going on.